Cognitive behavioral therapy emphasizes a focus on thinking patterns and behavioral patterns rather than on emotions. Another key element, behavioral activation, involves taking a systematic approach to identifying specific activities, situations, and people associated with positive mood and routinely scheduling them. Cognitive behavioral therapy (CBT) was developed by Aaron Beck, MD, a Philadelphia psychiatrist who was psychodynamically trained but found that form of treatment relatively unsuccessful with patients with chronic depression. In his first book on this topic, he wrote that depression originates from (and is maintained by) the "negative cognitive triad," an unrealistically negative view (thoughts) about oneself, one's experiences, and the future.1 By identifying these thoughts and challenging them—by learning to take a different perspective (eg, examining evidence for and against the specific thought or developing a more balanced view of the troublesome situation)—people can reduce their symptoms of depression and improve their quality of life. This strategy has been referred to as "cognitive reframing." Taken together, cognitive reframing and behavioral activation are the two cornerstones of CBT as it is currently practiced. 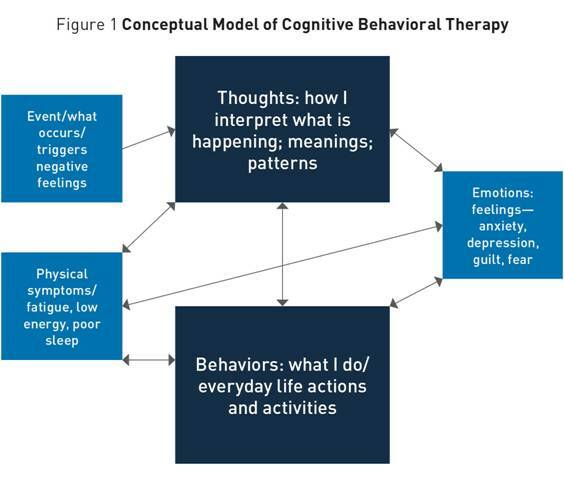 The conceptual model of CBT (shown in Figure 1) depicts linkages between thoughts, behaviors, feelings, and health symptoms. This is a modified version of Beck's original model used as a teaching tool with older adults to help them understand why the primary emphasis in CBT is on thinking patterns and behavioral patterns rather than on emotions. Emotions, as shown in Figure 1, are influenced by changes in thoughts and behaviors. As older adults learn and engage in cognitive reframing and behavioral activation, emotions will change as thought and behaviors become less maladaptive. Figure 1 shows how these elements interact with and affect one another. It is important to assess cognitive capacity and to evaluate whether a patient has sufficient memory function and cognitive processing skills to be able to participate in CBT, which teaches patients a set of skills for managing their moods. A patient must be able to learn new ways of thinking and be willing to engage in new behaviors. A brief cognitive screen such as the Montreal Cognitive Assessment (MoCA)3 is sensitive to early problems with executive function and is recommended for this assessment.3 Other quick screening tools are found in the Cognitive Assessment Toolkit available at www.alz.org. The Patient Health Questionnaire (PHQ-9) is recommended to screen for severity of depressive symptoms. It also is a quick tool that can be used to assess progress over time.4 The Geriatric Depression Scale has been widely used with older adults; information and downloadable short and long forms in multiple languages (as well as a free mobile app) can be found at https://web.stanford.edu/~yesavage/GDS.html. Other questionnaires may be added to the initial assessment. For example, additional screening tools can determine whether significant anxiety is also present, a common occurrence among older adults. Insomnia and related sleep difficulties are also common and distressing and are discussed here in a later section. CBT, typically planned for 12 to 16 sessions, is intended to be a short-term and goal-oriented therapy. Patients may or may not be receiving pharmacotherapy while in CBT. That is a clinical judgment best made by the treating providers or treatment team responsible for a patient's care. Then, based on all this information, work begins on the first goal, using cognitive and behavioral skills to bring awareness and effect change. Key to long-term success are skills such as identifying unhelpful thought patterns and learning techniques to modify them. Additionally, because many older adults are lonely and often estranged from family, increasing behavioral engagement in everyday positive activities is typically included in the array of skills. One or two goals at most can be accomplished in the available time frame. If additional longer-term treatment is necessary to work on particularly entrenched negative thought patterns and /or long-standing personality issues, the contract is renegotiated at the conclusion of the initial set of sessions and other techniques, such as identifying negative schemas and developing positive schemas to take their place, are initiated.6 Experience has shown that if reasonable goals are fashioned at the outset, most older adults suffering from mild to moderate depressive symptoms make significant progress in 12 to 16 sessions. A number of reviews attest to the efficacy of CBT to treat depression in adults. In 2006, Butler et al reviewed 16 methodologically rigorous meta-analyses on this topic, focusing on effect sizes that contrast outcomes for CBT with outcomes for various control conditions for each disorder. They found moderate to large effect sizes for CBT for unipolar depression and other conditions such as generalized anxiety disorder and concluded that their findings are consistent with other reviews providing support for the efficacy of CBT in adults. Three of the most common variables that fuel daytime sleepiness and disrupt older adults' sleep schedules include decreased activity levels, planned and unplanned napping, and medical illness. Older adults often express worries about whether they are getting adequate sleep or whether sleep loss negatively impacts their health. CBT for insomnia (also referred to as CBT-I), a nonpharmacological intervention for sleep disturbances, is a relatively simple and cost-effective treatment approach that can target individuals, groups, or caregivers of older adults. With adequate training, such interventions have been successfully administered by frontline staff, such as advanced practice nurses. Multicomponent CBT-I can include several different elements, many of which have strong evidence as stand-alone treatments for insomnia. Treatments typically begin with sleep education and general facts about the many functions of sleep. Although it is not supported as a solo treatment, the inclusion of "sleep hygiene" is common and includes ways in which individuals can engage in behaviors that promote good sleep. Examples include topics such as alcohol consumption, optimal sleeping temperatures, and the best times to exercise vigorously. Evidence supports the belief that poor sleep hygiene is enough to disturb sleep, but correcting only these elements isn't typically enough to rid an individual of all sleep problems. The behavioral components of CBT-I, referred to as stimulus control and sleep restriction, include recommending procedures around setting a consistent rise time, designating a sleep opportunity window, and recommending that patients get out of bed if unable to sleep, in addition to other instructions. Maladaptive sleep behaviors in a geriatric population, such as spending too much time lying awake in bed and napping during the day, fuel sleep problems. In addition, dysfunctional beliefs, such as unrealistic expectations for sleep time, result in more impaired sleep. Left untreated, depression in older adults can become severe and can lead to extremely serious consequences, including suicide. While many older adults with mild to moderate depressive symptoms may improve with CBT or other forms of psychotherapy alone, a substantial subgroup requires pharmacologic or other somatic treatments, such as transcranial magnetic stimulation or electroconvulsive therapy (ECT). It has been estimated, however, that as many as 40% of older adults who could benefit from antidepressant treatment do not receive these medications. 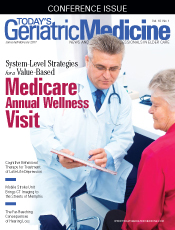 Moreover, older minorities receive pharmacologic treatment at even lower rates. When depressive symptoms have not remitted with CBT or other psychotherapeutic strategies, when symptoms have worsened to the point where a patient's daily functioning or health has become or is becoming significantly impaired, or when a patient's overall quality of life has declined significantly due to depressive symptoms, it is time to seriously consider pharmacologic or other somatic treatments. Setting aside depression with psychotic features, pharmacologic treatment of depression in late life generally should proceed in the fashion described below. First-line medications include the selective serotonin reuptake inhibitors or venlafaxine or duloxetine. In patients with known QT prolongation, caution is advised, particularly with citalopram and escitalopram. The geriatric principle of "start low, go slow" is especially important with antidepressants, because while side effects occur early in treatment, the positive effects on mood take significantly longer. It can take up to 12 weeks and sometimes longer for older patients to respond adequately to treatment. It is important to explore patients' prior experience with antidepressants, because some may have had negative experiences previously, due to a lack of efficacy or undesirable side effects. • It can take a long time to reach an effective dose. • In the interim, the provider is there to provide support. • Psychotherapy is a critical part of the treatment plan. • If a patient's symptoms have not improved after an adequate trial at an adequate dose, the provider has other options. If a patient responds only partially to one of these medications, augmentation with mirtazapine or bupropion is a reasonable strategy. Mirtazapine is often used to address depression with sleep disturbance, as it is quite sedating, especially at lower doses (eg, 3.75 mg to 7.5 mg nightly at bedtime). Bupropion, in contrast, is prescribed for use in the morning and can be helpful as an activating strategy. A general starting point is 100 mg SR daily in the morning or 150 mg XL daily in the morning. Other strategies commonly used to augment antidepressants in older adults with depression include the addition of an atypical antipsychotic such as aripiprazole or quetiapine, or the addition of a mood-stabilizing agent such as lamotrigine or lithium. Patients requiring such augmentation strategies should be referred to a psychiatrist with experience treating older adults with depression. Older adults whose depression is severe and has not responded to pharmacologic treatment, whose depressive symptoms are affecting their physical well-being (eg, resulting in significant weight loss), or whose depression presents with psychotic features (commonly manifest as delusions, such as somatic delusions or delusions of poverty, sometimes with hallucinations) require more urgent evaluation and treatment. Often, inpatient treatment is necessary to stabilize these patients. Furthermore, ECT is considered a first-line treatment for major depression with psychotic features. ECT is a highly effective treatment for older adults with depression, but many patients and families worry about the associated stigma as well as the cognitive side effects of this treatment. However, modern ECT techniques have made the procedure a safe, effective, and well-tolerated treatment. Indeed, ECT is likely underutilized given its proven effectiveness. To maintain response, some patients may need to continue maintenance (eg, monthly) ECT treatments after an acute treatment phase. With appropriate education, support, and monitoring, ECT has been shown to be an invaluable tool for treating older adults with severe major depression. In all of the scenarios described in this article, it is considered optimal for pharmacologic or somatic treatments to be combined with psychotherapy. Getting well and staying well are the goals of treatment for depression. These goals require ongoing care, work, and investment on the part of patients and their providers to ensure that the pharmacologic or somatic treatment continues to be tolerated and effective, the patient is continuing to practice techniques learned in psychotherapy (eg, cognitive reframing and behavioral activation), the family or other involved caregivers are supportive of the patient's ongoing treatment, and the patient knows there are additional strategies available should his or her symptoms reemerge or worsen. — Dolores Gallagher-Thompson, PhD, a professor of research in the department of psychiatry and behavioral sciences at Stanford University School of Medicine, is core director of outreach, recruitment, and education for the Stanford Alzheimer's Disease Research Center. Specializing in the study and treatment of late-life depression and anxiety disorders, she uses primarily cognitive behavioral therapy as part of the geropsychiatry outpatient clinic at Stanford. — Erin L. Cassidy-Eagle, PhD, CBSM, a clinical associate professor in the department of psychiatry and behavioral sciences at Stanford University School of Medicine, specializes in the treatment of mental health disorders in adults and older adults. Having practiced as a clinical psychologist for more than 20 years, she has a special interest in sleep, cognition, and mental health of older adults. — Laura Bodin Dunn, MD, is a professor of psychiatry and behavioral sciences and director of the Geriatric Psychiatry Fellowship Training Program in the department of psychiatry and behavioral sciences at Stanford University. 1. Beck AT, Rush AJ, Shaw BF, Emery G. Cognitive Therapy of Depression. New York, NY: Guilford Press; 1979. 2. Martell CR, Dimidjian S, Herman-Dunn R. Behavioral Activation for Depression: A Clinician's Guide. New York, NY: Guilford Press; 2010. 3. Nasreddine ZS, Phillips NA, Bédirian V, et al. The Montreal Cognitive Assessment: MoCA: a brief screening tool for mild cognitive impairment. J Am Geriatr Soc. 2005;53(4):695-699. 4. Kroenke K, Spitzer RL, Williams JB. The PHQ-9: validity of a brief depression severity measure. J Gen Intern Med. 2001;16(9):606-613. 5. Laidlaw K. CBT for Older People: An Introduction. Washington, DC: Sage; 2015. 6. Gallagher-Thompson D, Thompson LW. Treating Late-Life Depression: A Cognitive-Behavioral Therapy Approach: Therapist Guide. New York, NY: Oxford University Press; 2010. 7. Wilson KC, Mottram PG, Vassilas CA. Psychotherapeutic treatments for older depressed people. Cochrane Database Syst Rev. 2008;(1):CD004853. 8. Cuijpers K, van Straten A, Smit F. Psychological treatment of late-life depression: a meta-analysis of randomized controlled trials. Int J Geriatr Psychiatry. 2006;21(12):1139-1149. 9. Steffens DC, Blazer DG. Mood disorders. In: Blazer DG, Steffens DC, ed. Essentials of Geriatric Psychiatry. 2nd ed. Washington, DC: American Psychiatric Publishing; 2012:125-148. 10. Foley DJ, Monjan AA, Brown SL, Simonsick EM, Wallace RB, Blazer DG. Sleep complaints among elderly persons: an epidemiological study of three communities. Sleep. 1995;18(6):425-432. 11. Mellinger GD, Balter MB, Uhlenhuth EH. Insomnia and its treatment. Prevalence and correlates. Arch Gen Psychiatry. 1985;42(3):225-232. 12. Ford DE, Kamerow DB. Epidemiologic study of sleep disturbances and psychiatric disorders. An opportunity for prevention? JAMA. 1989;262(11):1479-1484. 13. Van Cauter E, Leproult R, Plat L. Age-related changes in slow wave sleep and REM sleep and relationship with growth hormone and cortisol levels in healthy men. JAMA. 2000;284(7):861-868. 14. Mathews M, Adetunji B, Budur K, Mathews M, Ramachandran S. An overview of sleep disorders in the older patient. Clin Geriatr. 2004;12(9):37-42. 15. National Institutes of Health. National Institutes of Health State of the Science Conference statement on manifestations and management of chronic insomnia in adults, June 13-15, 2005. Sleep. 2005;28(9):1049-1057. 16. Morin CM. Insomnia: Psychological Assessment and Management. New York, NY: Guilford Press; 1993. 17. Irwin MR, Cole JC, Nicassio PM. Comparative meta-analysis of behavioral interventions for insomnia and their efficacy in middle-aged adults and in older adults 55+ years of age. Health Psychol. 2006;25(1):3-14. 18. Qaseem A, Kansagara D, Forciea MA, Cooke M, Denberg TD. Clinical Guidelines Committee of the American College of Physicians. Management of chronic insomnia disorder in adults: a clinical practice guideline from the American College of Physicians. Ann Intern Med. 2016;165(2):125-133.